Rotarian CNY Books for the World, Inc. , a (501) c-3, non-profit organization, is a all volunteer Rotarian managed, collaborative effort working with Central New York Rotary Clubs, and The Second Wind Foundation. Together, they provide K - 6th grade picture/story and K – 12th grade textbooks to needed regions of the world to create opportunities for a better way of life. CNY BFTW also takes other Library & Professional books, if funding and space is available. CNY Books for the World, Inc. provides general book types and descriptions, packing specifications and delivery information to a central marshaling warehouse to the Rotary Club. The Rotary Club purchases from CNY BFTW, at cost, all the required packaging materials, organizes and manages the project up the pick up of the books from their project location, and supports cost of transportation from their site to The Second Wind Foundation in LaPorte, Texas. At the CNY BFTW central warehouse, pallets of books are weighed, and stored until there is sufficient numbers for a shipment to Rotary Books for the World (The Second Wind Foundation) in LaPorte. 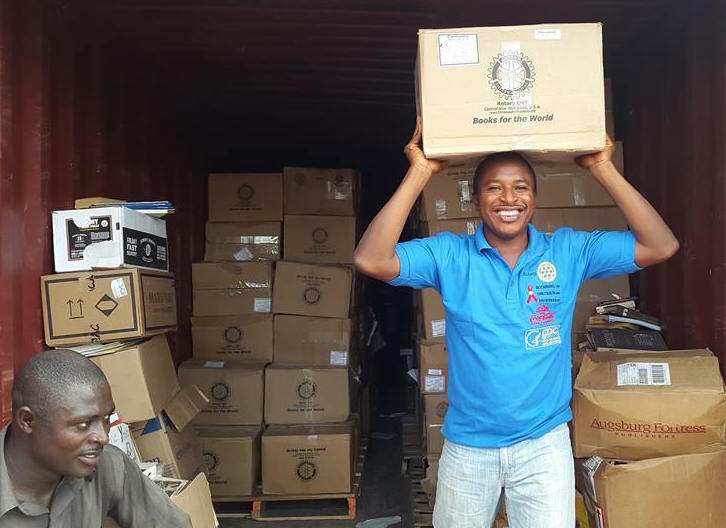 The pallets of books from all USA Rotarian collection centers are co-mingled, containerized and sent to third world Rotarian managed distribution centers. * Textbooks - are to be groupings of 10 or more (same title) with instructor’s material, if available. Where are these books currently hiding? Closets, book shelves, storage areas of homes, libraries, schools and churches, all looking for a home and children to read, learn from, love and cherish them. By combining our resources, we have given these books a fresh start, and are making a significant difference in the lives of the children of the world. CNY Rotary BFTW books depart from Seabrook Texas via sea container, combined with other Rotarian BFTW books, to the following destinations. The Texas end of the process is coordinated and managed by The Second Wind Foundation, a 501-c-3 organization set up and managed by Rotarians. 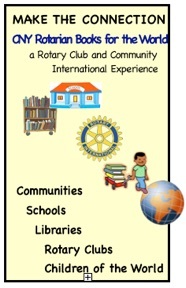 The receiving destinations are managed by Rotary district and clubs. Good morning. .... I write to thank you, all Districts, Rotarians and other individuals involved in this laudable programme of World Books [Books for the World] and Educational Materials for the benefit of mankind. I am pleased to announce that we took delivery of the container yesterday and was opened. We are very grateful for keeping your words and promise of being a Gift to the world. We didn't have crane neither fork lift. We resorted to manual approach to off load the books and brought down the container . This took us to almost midnight. All Rotarians of my Club were all there and involved completely. We plan to give it real publicity at all levels. All Clubs of the District will be involved in distribution to the needy rural schools. We sincerely appreciate those ones meant for primary and secondary schools. They will really touch the lives of school children in rural areas. We are grateful. Grateful for your kindness, time and commitment to serve humanity. God bless you immensely. This is real gift to the world. Adeyemi Oladokun ( PAG ), RC, Agbor, D 914O, Nigeria.